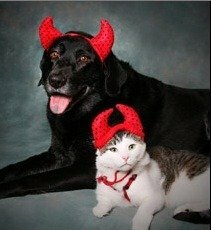 Planning to dress up your pup or costume your cat this Halloween? If so, you’re not alone. According to a recent DogTime survey, 57% of readers will be outfitting their pet on October 31 — perhaps only part of what makes that day the scariest of the year. Not surprisingly, the majority of pet dresser-uppers — 68% — are dog owners. But as companion animals are increasingly embraced as important members of the family, adults are including both cats and dogs in traditions once reserved for human children. In fact, a whopping 40% will spend upwards of $10 on their pet’s costume — not insignificant considering many Americans are watching their wallets these days. About 30% of respondents said they will hand-make their pet’s costume; another 30% plan to festoon Fido or Fluffy for ten bucks or less. Still thinking about how to include your pets in the celebration? Check out Secret Shopper’s guides to Halloween fun for dogs and cats. And don’t miss our suggestions for throwing the perfect Howl-o-ween party. This holiday, however, isn’t for every pet, and your companion animal may find the sights and sounds particularly unsettling. Remember: their comfort, security, and safety depend on you.